Abstract: Spatially complex beams of light, possessing phase- or polarisation-singularities, display several intriguing phenomena such as the ability to self-heal or carry orbital-angular-momentum. This talk will introduce their physics of operation, and describe the utility of generating and propagating them in fibres, for applications ranging from high-power lasers to quantum-state tailoring. Biography: Dr. Siddharth Ramachandran obtained his Ph.D. in Electrical Engineering from the University of Illinois, Urbana-Champaign, in 1998. Thereafter, he joined Bell Laboratories as a Member of Technical Staff and subsequently continued with its spin-off, OFS Laboratories. 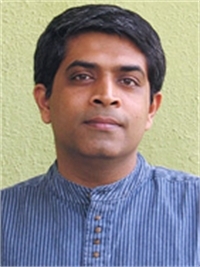 After a decade in industry, Dr. Ramachandran moved back to academics, and, since January 2010, is an Associate Professor in the department of Electrical and Computer Engineering at Boston University. Dr. Ramachandran's research focuses on the optical physics of guided waves and their applications to photonic devices. For his contributions in the field of fiber-optics, he was named a Distinguished Member of Technical Staff at OFS Labs in 2003, and a fellow of the Optical Society of America (OSA) in 2010. He is currently a topical editor for Optics Letters and has served on numerous conference and grant-review committees in the field of optics and applied physics.